Is The Market Undervaluing ArcelorMittal’s Stock? What Are The Major Revenue Streams For ArcelorMittal? How Is ArcelorMittal Likely To Grow In The Next Two Years? What Are ArcelorMittal’s Key Sources of Revenue? ArcelorMittal (NYSE: MT) released its Q4 2018 results on February 7, 2019 followed by a conference call with analysts. The company beat market expectations for revenue as well as earnings per share. Revenue of $18.3 billion in Q4 2018 was 3.5% higher on a year-on-year basis, whereas EPS increased by 15.7% to $1.18 in Q4 2018, compared to $1.02 in Q4 2017. 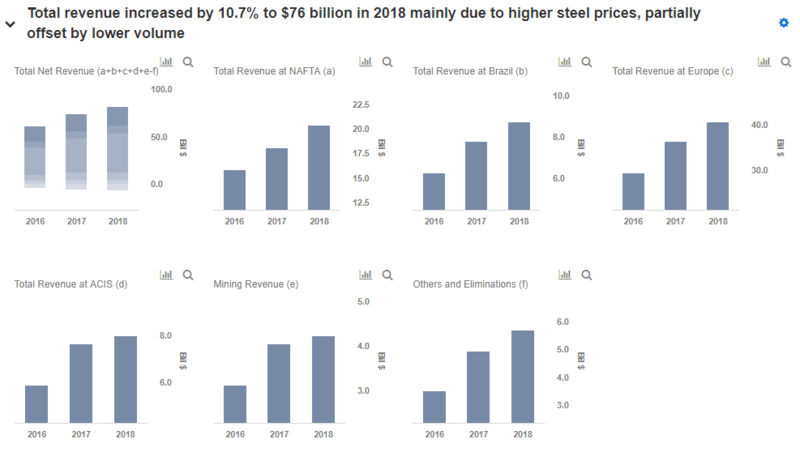 The improvement in financial performance was mainly due to a 13.5% increase in average steel prices, positive price-cost effect in the steel segments, slightly offset by 1.6% decrease in total steel shipments, and the impact of lower market prices for iron ore in the last quarter. The company’s bottom line growth for the year was also attributed to an income tax benefit of $349 million in 2018 compared to a tax expense of $432 million in 2017. The major takeaways from the announcement have been illustrated in the graphs using our interactive dashboard – Acquisitions And Higher Prices Come To ArcelorMittal’s Rescue In 2018. 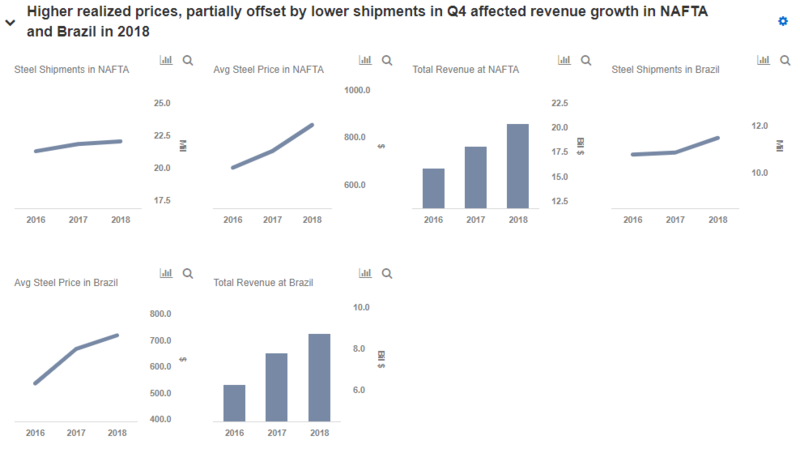 Lower shipments affected growth in NAFTA and Brazil: Revenue from NAFTA decreased sequentially by 9.5% to $4.9 billion in Q4, on the back of a decline in shipments by 6.2% – primarily due to seasonality and weak market conditions in the US – and a drop in global steel prices in Q4 2018. However, for the full year, shipments increased marginally by 1%, which along with a 14.8% rise in realized prices led to total revenue from the region to increase by 13%. In the Brazilian segment, in spite of shipments being sequentially lower by 1.4% in Q4, full year 2018 saw shipments grow by 5.8% mainly due to the impact of the Votorantim acquisition, which along with higher prices translated into higher revenues in Brazil. Europe – Ilva acquisition: Steel shipments for the region were bolstered by the acquisition of Ilva in November 2018. Shipments in Q4 increased by 4% primarily on account of the consolidation of Ilva. Excluding Ilva’s impact, shipments declined by 1.7% on account of a weaker long products export market. Though, buoyed by the acquisition, ArcelorMittal saw its volume grow marginally by 0.2% to 41.2 million tons for the full year, the organic growth in shipments was negative. Net sales increased by 11.8% to $41.5 billion in 2018 on the back of higher realized steel prices. Disruptions in ACIS: The ACIS segment proved to be a drag on the company’s overall growth. Shipments declined by 10.6% to 2.7 million tons in Q4 and for the full year shipments were down by about 10.3%. Lower volume was mainly a result of unplanned maintenance activities in Ukraine as well as an explosion at a gas pipeline at Temirtau, Kazakhstan. However, revenue from the region increased by 4.5% in 2018, benefiting from higher prices on the back of the favorable demand condition from the automotive and construction sectors. The operational disruptions are expected to hamper volume growth over the next year as well. Action 2020 Plan: Adopted in 2015, ArcelorMittal is two-thirds of the way along the Action 2020 Plan which expects to add $3 billion to EBITDA by 2020. However, it made limited progress in 2018 due to operational disruptions. The company added $0.4 billion to EBITDA during the year through cost and product mix improvements including – South Africa savings with improved cost performance driven by better mix following the restart of coke oven battery and higher PCI usage; optimization savings through digital transformation in Europe and saving in Ukraine at the coke oven battery; and Brazil cost and mix improvements. However, operational disruptions which led to a volume loss of $0.3 billion, effectively reversed the cumulative volume gains achieved in 2017. Though shipments declined by 1.6% (y-o-y), total revenue increased by about 10.7% to $76 billion in 2018, from $68.7 billion in 2017, primarily driven by higher realized steel prices on the back of increased demand from the automotive, machinery, and construction sectors. The company’s bottom line saw a marginal improvement, with net income margin rising to 6.8% in 2018 from 6.7% a year ago. However, instead of cost savings, this increase in margins was primarily driven by a tax benefit of $349 million recorded mainly in Luxembourg, in anticipation of higher future profits. Though ArcelorMittal expects growth to remain strong worldwide, the company projects a decline of 0.5%-1.5% in demand from China in 2019, as relatively stable demand from automotive and construction is offset by declining machinery output. This is in contrast to a demand growth of 3.5% in China during 2018. The stocks of major steel companies including US Steel, AK Steel, Cleveland-Cliffs, fell by 1.1%-5.3% in a day after ArcelorMittal’s projection related to China became public. Though ArcelorMittal has minimal exposure to China, a slowdown in Chinese demand would likely have an adverse impact on global steel prices. Taking this into account, we expect total revenue to grow by 2.2% in 2019, much slower compared to the 10.7% growth witnessed in 2018. Sales would mainly be driven by recent acquisitions, stable demand conditions, offset by a decline in Chinese demand. 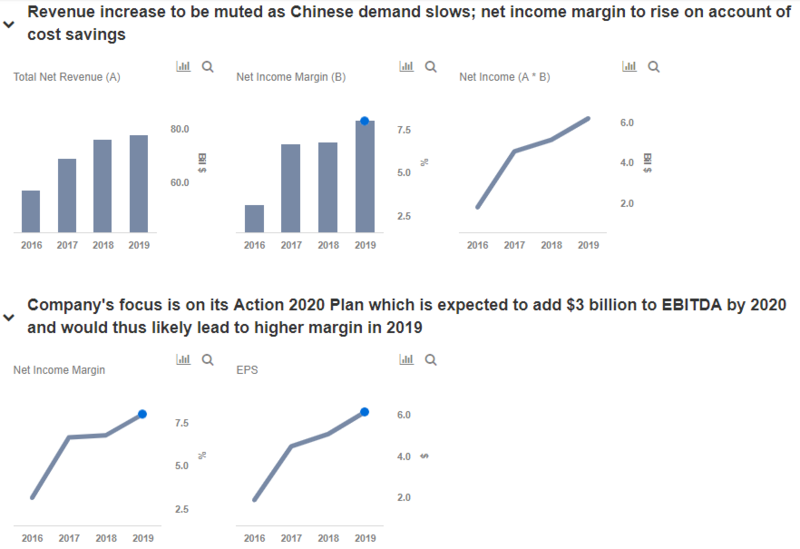 Net income margin is expected to rise to 8% in 2019 due to cost efficiencies as the company nears the end of its Action 2020 Plan, which would, in turn, push EPS higher. We have a price estimate of $35 for ArcelorMittal’s stock price, which is higher than its current market price. On February 7, 2019 the company announced a share buyback program, which it intends to complete by December 2019, under which it plans to repurchase 4 million shares. Along with share repurchases, the company’s ongoing debt reduction program (which has been successful so far) and increased dividend is expected to support growth in the stock price through 2019.